My elder son loves cars, trucks, and things that go! 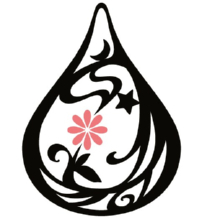 What vehicles did we get on in Kinugawa this time? The ropeway was renewed in 2005. 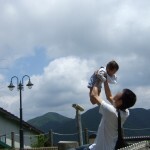 It brought us up to the summit of the mountain, where we could view the whole Kinugawa town. We could feed some monkeys and deer, who must enjoy the life there! Just a 30-minute-trip would get yourself fully refreshed. It brought us to top of the mountain. The inn where we stayed (Hananoyado Matsuya) provides a shuttle bus service, taking us to some museums. We took the bus at the inn and visited Yumeji Takehisa museum. My son got more excited to get on this bus than to appreciate Yumeji Takehisa’s works. This Retro bus reminds us of Taisho era. 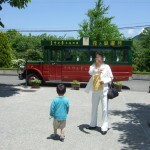 Kinugawa and Kawaji area is one of the few places to ride an amphibious bus. I hope to be back again to try this bus, which goes on water as well as on land. 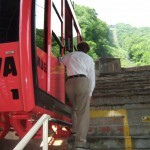 An 80-minute-tour will take us around and into the dam. Sounds exciting! 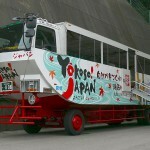 This is an amphibious bus in Kinugawa & Kawaji area!